Uco bank establish in 1943 in Kolkata. Uco bank is a commercial bank and a Government of India Undertaking. 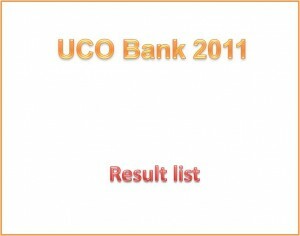 Uco bank is one of the fast growing bank with branches all over Indian city.Here is list of successful candidate in Uco Bank examination held on 14th November 2011. Three time of given vacancies will be called for interview and with performance in interview and also in written test this is what selection procedure. After clicking of following list there will be display page containing link for list of candidate. Also link of call letter for interview where you get interview center and time of interview. Take print out of it for interview. There will also link for reprint of online application.